As a child, I didn’t eat many vegetables. As an adult, I eat many more, and I love to eat seasonally. This is why you will probably often hear me saying that such-and-such a vegetable is my favourite. It would probably be more accurate to say that such-and-such a vegetable is my favourite right now. At the moment we are into the asparagus season, and it is cheap and plentiful. And right now, asparagus is my favourite vegetable.I eat it with eggs, in salads, on its own with butter, in risottos – you name it. In general, the bottom end of the stalk becomes tough and woody, so it is best to cut, or snap it off. I really hate throwing food away, especially something as tasty as asparagus. So, I decided to try to use these woody stalky bits up. Soup is the obvious answer. First, I tried to blend it in a food processor, but this just resulted in smaller woody bits in the soup. I also have a food mill, and one day I tried it through that, and it turned out that the low tech version was the best, since the woody bits are not passed through the mill. I really recommend these – I picked mine up for a tenner back in the UK, and I use it weekly. This year I planted my own asparagus, and freshly cut asparagus should not have the woody stalky bits. 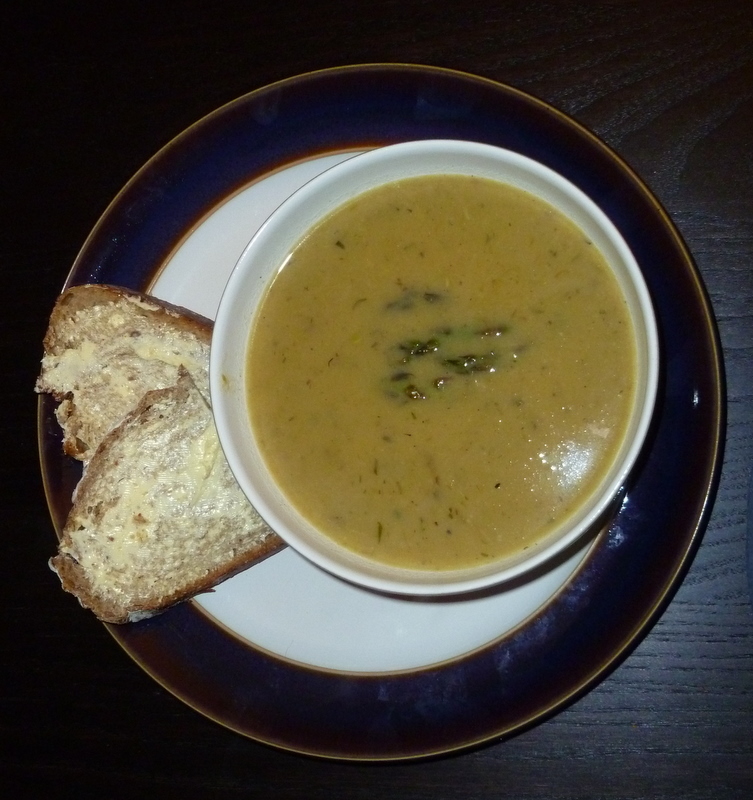 I wonder if this soup will continue to feature in my spring repertoire? I hope so, it really is good! The following recipe varies in amounts, depending on how many stalks you have been saving in the fridge. The stalks will keep for up to 10 days (depending on age when you bought them, and the width of the stalks), so you can save them up from a couple of bunches to get a good amount, if you like. Sweat the onion and thyme in the olive oil, until the onion is fairly soft, but not coloured. Add the stock. You need to allow enough stock to cover the vegetables in the pot by a couple of cm. Bring to the boil, then simmer until the stalks are tender to the point of a knife. The time for this can be anything from 5 minutes for the really thin stalks, up to 20 minutes for the later season asparagus. Take off the heat and allow to cool for 5-10 minutes. Then, pass through the food mill into a clean pan. Add a little crème fraiche. Again, the amount you add will depend on the amount of soup that you have. Season with salt and pepper. This soup can be served hot or cold, especially if you are having a really warm spring/ summer, like the one that we are having now. If you are serving it cold, add a little water to thin it, allow to cool completely, then refrigerate for an hour or two. Garnish it with croutons, cooked asparagus tips, small dice of cucumber (seeded and peeled), or some of all three. A little chervil can be chopped and stirred through, or used as a garnish as well. Check for seasoning before serving, as cold soup can often need more seasoning that its hot counterpart. If you want to serve it hot, warm the soup gently, without boiling. The soup can be made ahead of time, and warmed through at a convenient time. Garnish with cooked asparagus tips, chervil, or a dollop or swirl of the crème fraiche. Serve with buttered brown, rye or sourdough bread. I prefer bread, as opposed to toast with the hot version of this soup.